Most art is at least partially visual. The majority of our great composers tried to encapsulate visions of events, landscapes, people, or relationships in their songs. Thus, the visual representation of your album should receive at least some thought. Even if you only plan to distribute your music via download, there will be a digital picture associated with your digital album. The better this picture fits the mental image of your record, the more memorable your music becomes. If this is starting to sound like labor to you – tough luck, because today I will be writing about the process behind generating the cover art, layout, and logo of my album. As an artist, you are supposed to have an opinion about these sorts of things, even if you hand all of the actual work over to a professional graphic designer. Yes, even if you are blind, your opinion matters! Visual art is always subject to personal taste, which makes it impossible to create an all-pleasing CD cover. However, for your debut album, you should still try to create something beautiful. For example, the covers of Chumbawamba albums are often the subject of controversy, because their weird artwork rarely shows a direct association to the content of the CD, or even to reality itself. Nobody buys a Chumbawamba album for its beautiful, thoughtful, eye-pleasing cover art. So, if your first record looks anything like that, it is not likely to sell well. The first step for me was to generate an album title. As you recall from my fourth blog post, all of the songs on my record circle around the topics of life and love, so I put those two words on a piece of paper, and allowed them to fester. I dug deeper into my music, and discovered that more than life itself my songs explore the forces that drive it, investigating the spark of life, if you want. After a few days of penciling words on paper, I arrived at The Fire Within, and I was quite happy with that. My songs generally explore the fire that burns inside the human mind, the mental forces that drive our existence. Title: check. Next I thought about the things that I wanted to showcase on my album cover. If you sell physical CDs, you have at least three advertisement panels to consider: the two sides of the CD sleeve, and the surface of the silverling itself. Obviously, you can plaster those spaces over with a picture of your favorite guitar, and a long list of thank-you-notes, but I find that a bit boring. It is a nice thought, but you are probably targeting an audience that is much greater than your circle of friends and mentors, so the vast majority of your readership won’t have any interest in reading your thanks. You can still put them on there, but don’t make them a focal point. In my typical selfish manner, I wanted to showcase my personal passion and dedication to music and art, so I planned to show pictures of all the instruments that I play on this record. But how could I make that subtle? My album title focuses on fire; how about a campfire, made of instruments? Setting acoustic instruments on fire is obviously not a great concept, but a wood pile consisting of guitars, ukuleles, and other instruments would look pretty interesting, eh? Then there had to be a picture of myself. That is just self-promotion 101 – people remember you by your face, so you better stick it on your product. Luckily, I am not associated with any record label; they will force you to put your face on the front of the album. For the band manager exists simply no alternative, which can be pretty frustrating. Ask cellist Ben Solee: he loves his vinyl covers, because he co-designed them. Yet he is at odds with his CD covers, because his record label always slaps his face on the front. However, I would be releasing my record independently, so I was allowed to do whatever I wanted. Since I was determined to print CD wallets, I had four paper panels to fill, which allowed me to perform a little party trick: the front cover shows my beloved pile of instruments, and in its continuation to the left (on the back of the CD wallet), the photo shows myself playing the autoharp. Goemon5 surrounded by instruments in his album artwork. 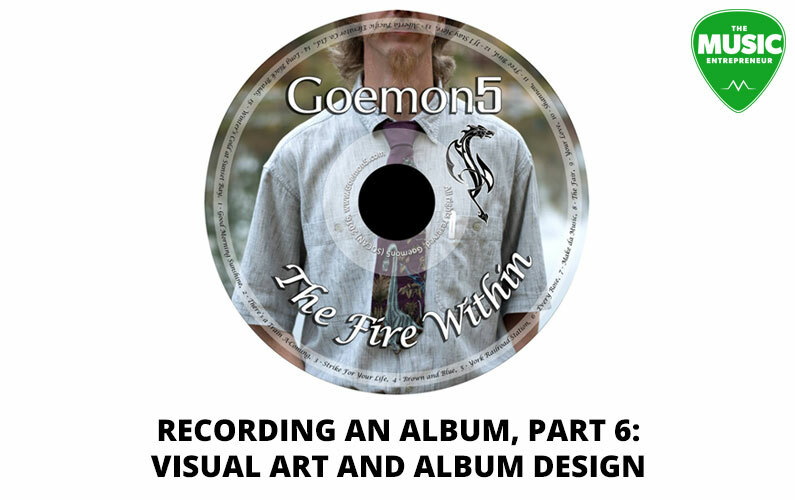 There we have the cover art: an exploration of the album title The Fire Within, illuminated through a potential campfire constructed of acoustic instruments, and in self-discovery via autoharp (the inner fire that the album actually explores). I shot a few concept photos via self-timer on my pocket camera, and asked my friend James Tworow to professionally shoot the scene, so as to control lighting and object positions. Cover art: check. That’s where I ran out of ideas, so I indirectly asked for external help. I employed my friend Alyssa Hanke (Alyssa H Photography) for a promotional photo shoot. I dressed up in my stage outfit, grabbed my favorite 12-string guitar, and met Alyssa in a park downtown. We picked a gloomy autumn afternoon for that occasion, so as to fill the photos with colors, as well as with natural emotions. Alyssa is a master of her craft, so the photos that came out of that shoot are all beautiful. I employed one of them for the inside of the CD wallet, and another for the CD itself. External assistance: super helpful. Even though Alyssa knew little about her actual involvement in this project, she supplied me with some pretty iconic shots for two of the five panels. All the other photos that she shot during that session are great promotional pictures that I spread throughout my social media pages and other promo material. The fifth panel was tricky. I did not want to see any more of myself. Nobody wants to see the performing artist on every single panel, so the last shot had to be something new. As you remember from last week, I shot a whole lot of material during my studio sessions. Thus, the last panel would either contain a collage of all the session musicians that contributed to this record, or a highlight of a few exceptional artists. With sixteen session musicians on this album, the former would have required very small pictures, so I decided on the latter option. There is one person that is featured on a great number of photos, from various sides, and it is the person who made the greatest contribution to the beautiful sound of this record: my producer Craig Newnes. I quickly singled out a small number of potential shots, and after some debate decided on one of them. Warning: if you plan to put pictures of people other than yourself on your CD sleeve, you better ask those people for permission. Producers, in particular, love to work in the background, and may not appreciate your plans. Producer Craig Newnes in the album artwork. So, there we have all five panels filled. Evidently this rough design process was followed by a lot of trial-and-error to fit album title, artist names, track list, and other text onto the CD wallet, and I thank Alyssa H and Martin Aak for their input in this matter. It’s always good to show your design ideas to a friend, and ask for an honest opinion. Art grows through constructive criticism, so make sure you get some. As you can see, my layout works quite heavily with photos. Some people don’t like that, and if you are one of them, you can bugger off and wait for next week’s post, because the rest of this blog walks in the same direction. I don’t trust anyone to mock around with my art. I did not have much money to spend on layout. I have a little bit of talent for graphic design and photography, so I took this as an opportunity to develop the artwork myself. Many artists utilize geometrical patterns or photos of generic objects as CD backgrounds, such as curtains, tapestry, or floor tiles. Obviously, you can use whatever you like, just as long as you fit the artwork to the concept of the album. Whatever your main criteria might be, keep in mind that this is your personal product. You will have to live with its look until the end of days, so you better pick a layout that you can proudly present to an audience of thousands of uninitiated fans. Another great advantage of working with myself as graphics design team is the permanent access to the source material, as well as maintaining a flow of ideas. Whenever I need a new promotional poster or handbill, I can easily build on a previous collage, implement new ideas, and integrate older photos or artwork. For example, in my social media campaign, I mostly used digital posters that show a number of studio shots of my session musicians, and that roster was gradually updated as my list of sessionals grew. Some of the many session players that appeared on Goemon5’s album. 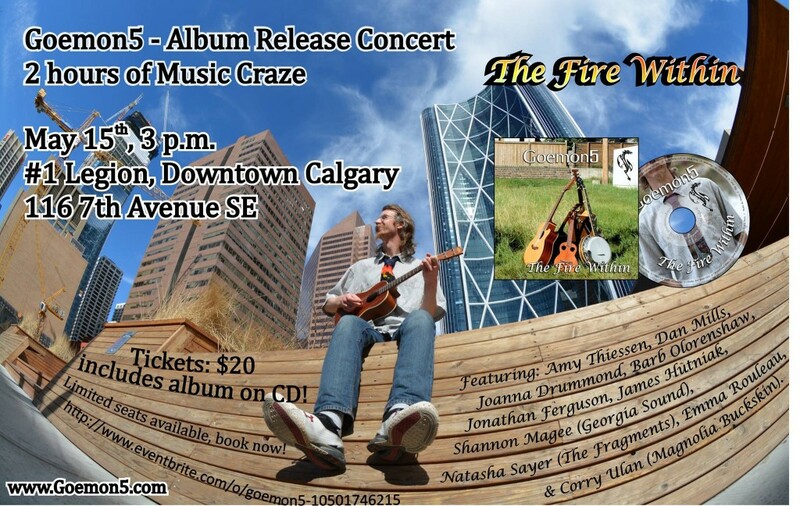 Even the last of my advertisement posters for the album release concert incorporates design elements from previous editions, although the layout differs vastly from anything that I designed before. “Corporate Identity” is an important factor in your public representation. Yes, even as an artist. If you have a consistent visual representation, people quickly start to associate a distinctive font, graphic style, or logo with a certain style of music, and eventually your artist name. There is something to be said about variety, but you should also try to define a visual framework for yourself, so that people start to recognize your show announcements, even if your poster is surrounded by dozens of posters for other events. Specific color compositions and logos work great for that. As mentioned, I get high on graphic design, so I decided quite early that I wanted a logo. Your personal logo can cost anything from $200 to $1000 CAD, or more. You can also design one yourself, if you feel so inclined. For example, if your band name is “Bold, Amplified Music”, you can print out the letters BAM in a font of your choosing, and rearrange them, until you reach an eye-pleasing combination. Simple graphic designs can be very effective, so don’t hesitate to give it a try yourself. However, I wanted something more sophisticated; a logo that is unique to myself, and representative of my cultural background, as well as my music. For that reason I hired another Calgary talent: Cari Buziak (Aon Celtic Art). After a few discussions and three revisions, Cari presented me with my personal logo. I could write a whole blog post about this, because there is so much to discover in her art, but for reasons of simplicity, I will confine myself to some key points. What you see is the perfect dragon. It combines all five elements of the philosophy of Japanese sword fight. 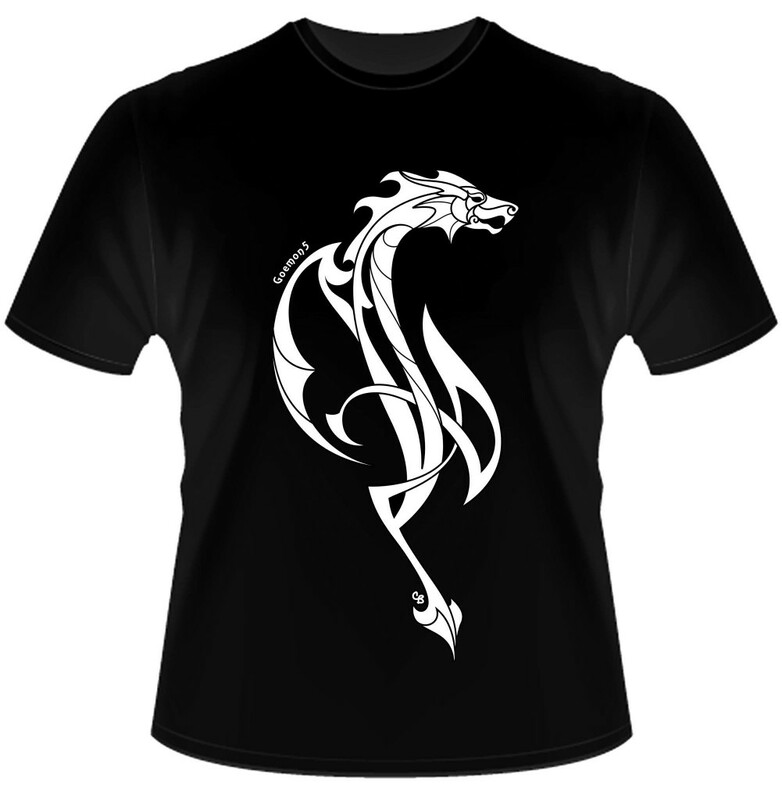 Yet, its design is founded on a Celtic form, which also defines my music. The dragon head even features a mustache; how much more ME can you possibly put into this logo?! This dragon is a perfect representation of me and my music, so I have something that I can proudly slap on every one of my products, be it T-shirts, CDs, or posters. Goemon5’s great-looking logo on a T-shirt design. If you see this dragon anywhere, there is little chance that you will think of anyone but the Celtic guy with the painfully long blog posts on DAWcast. Perfect! Okay, enough of that. The most important lesson in all this is IDENTITY. Whatever you choose to do with your record, make sure that it represents what and who you are. The journey of self-discovery can start with the album title: create one that represents the music on your album. Then brainstorm about the cover art, starting with the album title and expanding into a deeper understanding of your music. Don’t forget to incorporate your own face into your layout. Even if it is just a sloppy ink drawing of your head in profile – YOU are the face of your music! The remaining panels of your CD wallet, sleeve, booklet, or CD should be filled with pictures that you like, and which ideally have some association with your music and personality. Just keep in mind that this is going to be out there forever, standing as an eternal representation of your visual taste (or lack of it). So, remember to show the design to your friends and request honest feedback. If you want the whole deal: get a logo. A personal logo is not just emotionally satisfying; it also serves as a great visual mark of identification. And in our quickly revolving world of media, news, and resulting hysteria, identity matters more than ever before. I hope you found something useful in all this. Yes, graphic design is not everyone’s hobby, but you should at least have an opinion on it. Remember: this is YOUR product; own it! It is never too early to think about the layout of your album, because these ideas take a long time to develop and ripen. 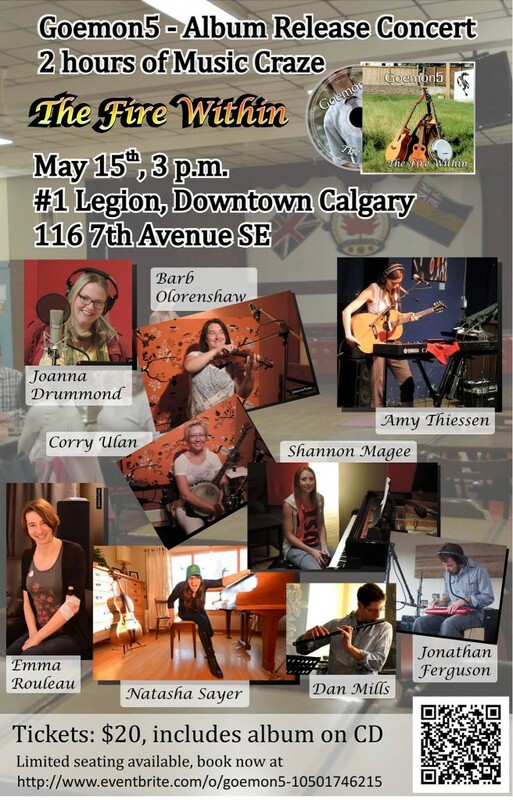 Goemon5’s upcoming album release party in Calgary, AB. Ideally, by the time your producer has finished your album mix, you should have a nearly final album layout as well. You can then put the finishing touches on the design, while a man with big speakers masters your record. That’s where we are headed next week: mixing and mastering the album. Until then, stay puff!